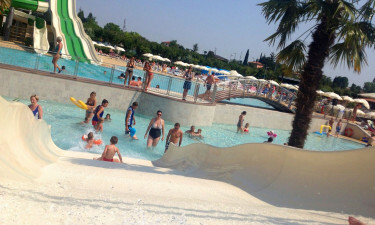 Camping Lido (Pacengo) is a wonderful resort found upon the eastern shores of famous Lake Garda. As this luxury camping site boasts an incredible 120,000 square metres of space, there is no doubt that visitors will enjoy a superior level of privacy. This amazing size is able to accommodate just over 2,000 guests. Those who are looking for more information about this camping holiday should contact LUX-camp at their convenience. Why should I camp at Camping Lido (Pacengo)? Families arriving here with their young ones will be pleased to know that Camping Lido provides numerous fun and engaging activities. There is a large swimming pool supervised by trained lifeguards during the peak tourist season. Professional children's entertainment is offered; an advantageous feature when parents require a bit of peace and quiet during their stay. The shores of Lake Garda will naturally offer up hours of enjoyment for adults and children alike. Luxury camping here is further defined by the wealth of amenities that are provided to guests upon their arrival. There is an onsite infirmary if any type of basic medical attention is required. All sanitary facilities are equipped to handle the needs of anyone with mobility issues. Wireless Internet is available throughout the site as well as within each mobile home. Please note that leashed dogs are allowed here (except on the shores of the lake itself). Camping Lido offers a wide variety of sporting activities to its guests. Basketball, tennis, table tennis and football are all possibilities. Of course, this is to say nothing of the options provided by Lake Garda itself. Snorkelling, swimming, kayak rentals, sailing and excursions to nearby towns are additional aquatic options to consider. A restaurant, a bar and a pizzeria can all be found only moments from one's mobile home. 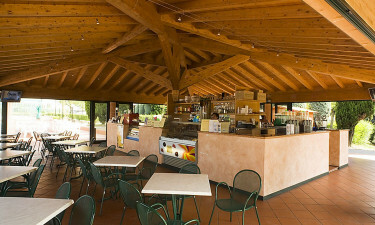 These offer traditional Italian cuisine, tasty varieties of pizza and international foods. A takeaway menu is also available upon request. Cocktails and a selection of fine wines and beers can all be enjoyed by visiting the bar.